Dedicated to Saving our Shipwrecks "From Prevention to Preservation"
New Date and Venue for 2019 UMSAT Show!! We are always looking for speakers that would like to present a great topic about their scuba diving or adventure travel experiences. Please let us know if you, or anyone you know, would like to be a star and speak at a future UMSAT Show! Check out the most beautiful magazine ever produced in Northern Minnesota! Air Down There Scuba offers free air fills and special pricing on rental equipment while participating in GLSPS projects. Thank you, Scott and Tracy! Aquaventure Dive and Photo Center offers free air fills and special pricing on rental equipment while participating in GLSPS projects. They have also loaned us a GoPro HD video camera for a few projects. Thank you, Steve and Jolene! Videos produced by Steve at Aquaventure Dive and Photo Center filmed in Lake Michigan on a Milwaukee charter trip. Click on their above logo for information to join them on a charter to visit these shipwrecks. Jay Hanson from North Shore Scenic Cruises has helped the GLSPS on many projects. Jay has many years of experience as a Captain, dive shop owner, dive instructor and commercial diver. Jay has taken a different path for the past few years and his scuba charters are no longer available. However, in 2012, Jay purchased the Wenonah which was previously used to transport people from Grand Portage, MN to Isle Royale, MI. He now offers day cruises on the North Shore of Lake Superior and is docked at the Silver Bay, MN Marina. If you are interested in booking a 2 hour - day charter cruise on the North Shore of Lake Superior, please click on the logo above for information on joining him and his staff on a north shore day cruise. One of our favorite historic museum ships is in dire need of your help. The whaleback SS Meteor, built in Superior Wisconsin 107 years ago by the well known shipbuilder Alexander McDougall, has been a museum ship in her home town since 1971. In 1896 there were nearly 40 of her type afloat, while today she alone represents her whole class. The ship is in generally good condition, in spite of widespread rumors to the contrary, but it needs a great deal of cleaning, painting and routine maintenance. Superior does not have the resources to properly care for the ship, and volunteers are badly needed to undertake some of the necessary tasks. Chipping and painting of deck equipment and engine room spaces are planned and an overhaul of exhibits is scheduled for Spring. Superior Public Museums is seeking grant money to drydock the ship sometime in the next two to three years to undertake more ambitious hull maintenance work. The goal is to complete that work before the ship reaches its 110th birthday in 2006. This year, four members of GLSPS teamed with six WUAA (Wisconsin Underwater Archeological Association) members to continue the work started last year. 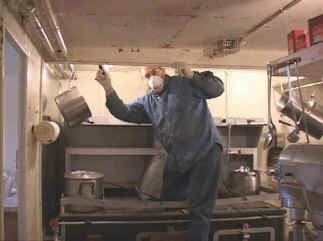 Last year, WUAA chipped, stripped, and primed the upper engine room and stripped a large part of the lower engine room. 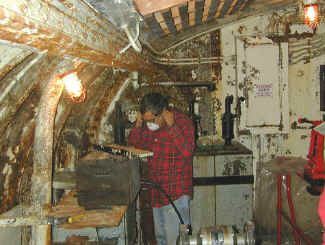 This year, WUAA and GLSPS teamed up for a weekend Sept 26-Sept 27 to the finish the painting in the upper engine room and stripped and primed and painted the galley. Lodging for the weekend and lunch is donated by the museum group. All you need to join in is the willingness to spend a weekend doing a little hard work. In the evening we were entertained with a presentation on the Christopher Columbus, the most famous of the whalebacks. 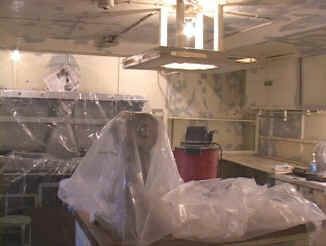 Last year the engine room looked like this after stripping. After priming last year, the final engine room painting makes the engine room look like a new ship. 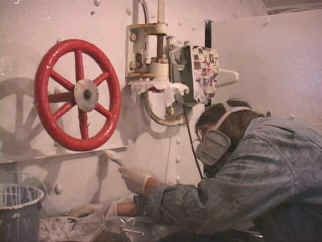 There are lots of nooks and crannies to paint in the engine room to do the job right. The forward engine room bulkhead was restored to its former look. 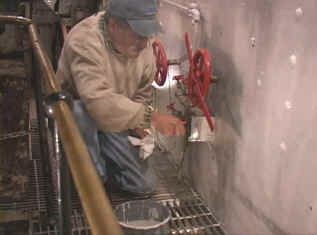 GLSPS volunteer Harold Rochat chips paint in the galley skylight. 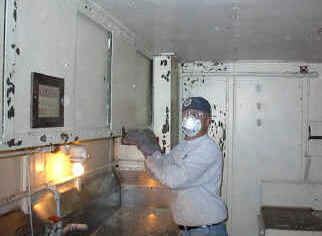 The bare metal areas on the galley walls were primed before final painting. The galley primed, covered, and ready for the finish coat. And a coat of white paint finished the galley painting job. 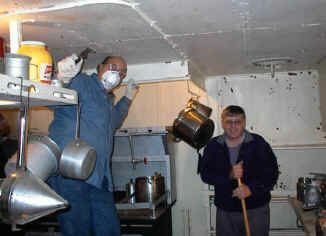 Harold Rochat and Jerry Eliason chipping paint and cleaning the galley. Ken Merryman chipping paint from the galley cupboards.